Wood carving is a kind of art that transforms and brings wood to life. Learn how it's possible to get started in wood sculpting and wood engraving. What used to be called whittling, something done by pops and granddads to use up their spare time, has developed into a full-scale hobby. Walk into any book store and it isn't difficult to find a complete section dedicated to wood working and wood carving. Carvers can scan many monthly magazines dedicated to the hobby or make a journey to the hardware store to find many tools designed specifically with wood carving in mind. Wood carving is popular! Forget about any thoughts of using a pen knife to tediously craft a toy or sculpture. Today's wood carving tools are composed of specialised chisels, spare time interest knives, and power tools like scroll saws, dremels, and table saws. Additionally, wood carving patterns can be acquired and used as a template to make complicated and monumental works of humanities. It is not important to have all of these tools to start wood carving. Commence with a straightforward pattern and practice with a basic set of wood sculpting knives on a soft wood like basswood or balsa wood. After gaining an understanding of the tools how they handle on the different species of woods available, move on to the subsequent tool or saw and practice as much as you feel you need to. Wood types are abundant and many wood carvers regularly blend one or two differing types of wood to create a novel project. This practice is particularly common with wood inlay where different colours and textures of wood are in employed. 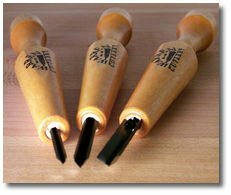 Beginners to wood carving would do best to start practice with basswood or balsa wood, and then move on to harder woods after learning the best tools and systems for wood carving. The best tip for amateurs, except for choosing woods that are simple to work with, is to avoid employing a heavy hand when chiselling or carving. Don't force the tool into the wood as it may cause it to split. Instead, make tiny frequent cuts, permitting the image to be exhibit itself. Practice the best way to carve with the grain and not against it. Another tip for beginning wood carvers is to understand when to stop carving. Many a gorgeous piece has been messed up by that last cut that was intended to perfect it. Remember the saying “ less is more”, and when you have removed a chunk of wood from the project, it cannot be replaced. Patience and a steady hand is vital in wood carving. “A Newbie’s Guide to Woodworking” answers common woodworking questions and more! 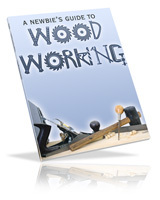 It delivers solid information that woodworking beginners can use and benefit from. We have researched the leading websites and expert information and compiled it all in this convenient book! There is all kinds of information available today that can help get you into woodworking as a hobby. Why should you spend your time and money investing in books and clubs when you can get everything you need RIGHT HERE! As a beginner you can be confused by the immense scope of aspects to the wonderful craft of woodworking. To many, this can be frustrating and lead them to give up. However, woodworking can not only be a means of making a living, but for many, it is a fun and rewarding hobby. Have you ever thought that your air compressor was too big, bulky, and noisy for the minimal amount of time that you use it and find yourself wondering why you keep it around? Trade it in for a new system that works excellently for the smaller work shop spaces. 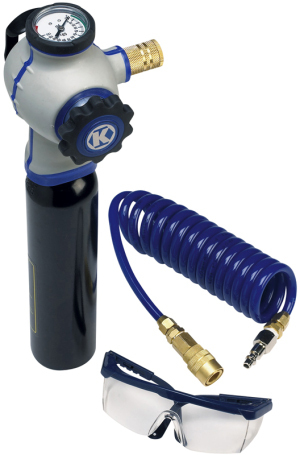 Lowes’ came up with this great Kobalt Portable CO2 regulator that powers most pneumatic nailers. This unit with the 20 oz CO2 canister can shoot 600 16 gauge brads or 1200 pins. This is the same system that paintball guns use, so refills and extra tanks are readily available. The kits cost around $100 each at Lowe’s and one is worth every penny. If you don’t use the gun that often or if you do cabinet installation jobs it remains very useful. The refills are about $10 each, so it’s a great price for a product that turns all your nail guns into cordless machines. It is very quiet to use and only uses up a small space in your work area. Another positive is that there is no water vapour in the system so the nail gun lasts longer. One complaint there is with the unit is that if there is any small leak along the line anywhere or in the gasket in your gun, you can easily lose the entire canister of CO2 in a matter of minutes and then require a refill. So it is probably a good idea to have a spare refill canister around. Remember to turn off the valve! Still, it’s a pretty good trade off to be able to use a gun without having to lug around the compressor, and look for an outlet. Even though this will never replace the air compressor, it is an extremely useful and efficient product in many ways especially if you do house calls or minor repair work. It would warrant a five if they built a quicker shut off valve instead of the screw valve. A lathe is a machine tool which spins the workpiece to perform various operations such as cutting, sanding, knurling, drilling, or deformation with tools that are applied to the workpiece to create an object which has symmetry about an axis of rotation (Wikipedia ). Lathes perform the machining operation known as "turning." While turning, material is removed from a workpiece by rotating it against a tool. Turning is a central production operation in the manufacture of many metal, plastic and wood parts. Lathes can be either manually operated or computer controlled (CNC). Lathes can have many differences, unique features and accessories to facilitate a wide range of jobs. The simplest lathe type is the wood lathe. As the name suggests, it is designed for turning wood. Wood lathes are small machines consisting of a bed, headstock, tailstock and tool rest. Unlike with what is found on a metal-working machine, there are no precision ways since the cutting tools are moved by hand and not by machine power. A steady hand and good skill is needed to control the cutting tool to accurately turn smooth curves and complex contours on the work piece. The spindle is driven by a belt connected to a motor, and speed differentiations are made by manually moving the belt to one of many pulleys mounted to the back of the spindle. Lathe tools are held by hand against the work, with the support of the tool rest. The tool rest is adjustable and is clamped to the bed at a position that best suites the operation at hand. Wood finishing can be tricky and after spending hours on building your project you want to be sure that you get the best outcome possible. You will learn about every step in the wood finishing process from a professional wood finisher with years of experience. Here are just a few of the chapters you will find inside.